Charcoal-fueled grills and smokers are the traditional devices used for smoking meat, but gas grills accomplish a similar end when following the proper steps. The basic elements of fire and wood chips apply to gas grilling as well but require an extra step for successful meat smoking. Though not the most ideal approach to smoking (wood chips smoke more easily when tossed directly atop lit charcoal), gas grill smoking offers a more convenient method of meat smoking with less cleanup than charcoal. Generously rub the desired dry-rub seasonings over all external surfaces of the meat or poultry, cover in plastic wrap and refrigerate overnight. This allows the seasonings to cure the meat, which adds flavor and helps keep it from drying out during the gas grill smoking process. Dump the wood chips into the plastic bowl or bucket at least one hour prior to grilling time and add enough water to completely submerge all chips except for those that float to the surface. Wet wood chips provide more smoke for the grilling process, which in turn provides more flavor. Open the grill lid and fire up all gas burners to high. Close the lid and allow the grill to preheat while performing Step 4. Place two large handfuls of soaked wood chips in the center of the foil sheet, then begin folding the edges of the foil to fashion a square and enclosed pouch around the wood chips. The pouch should be about 5 inches long on all sides. Poke several holes on the top and bottom of the foil pouch with a fork. These holes allow smoke to escape the pouch and flavor the meat during grilling. Open the gas grill and use protective gloves and either pliers or custom grate removal handles to lift the grate off the grill. Place the foil pouch directly atop one of the lit grill burners (either the burner to the extreme left or right of the grill when facing it). Replace the cooking grate and turn off all other grill burners except for the one supporting the foil pouch. Place the meat on the grate atop the unlit burners and close the lid. Adjust the grill temperature to about 300 degrees Fahrenheit. Chips should begin smoking after about 5 to 10 minutes. 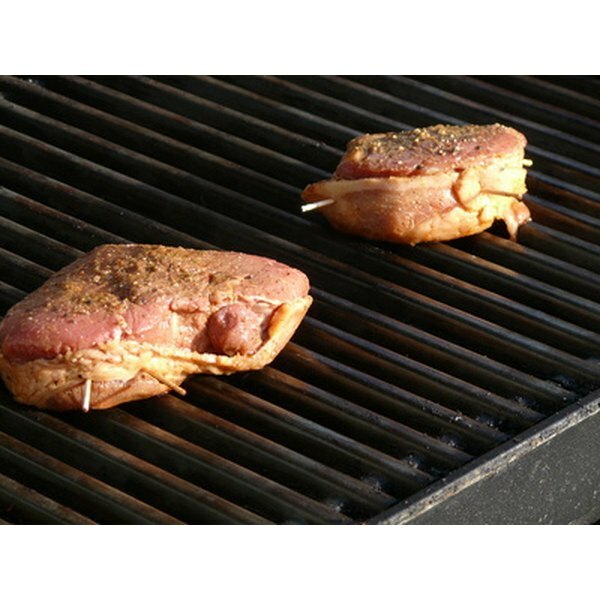 Cook meat to desired temperatures, checking every 30 minutes or so with a meat thermometer. If chips stop smoking, remove the foil pack and add a new one with fresh soaked chips. Smoking requires indirect heat for longer cooking times, which is why meat is placed above the unlit burners. Whole chickens, ribs and roasts can take several hours, so be patient. This is not the cooking process to use when in a hurry. Always wear heat resistant cooking or grilling mitts when handling hot grill grates, lids or when adding foil packs to the burners to avoid serious burns. 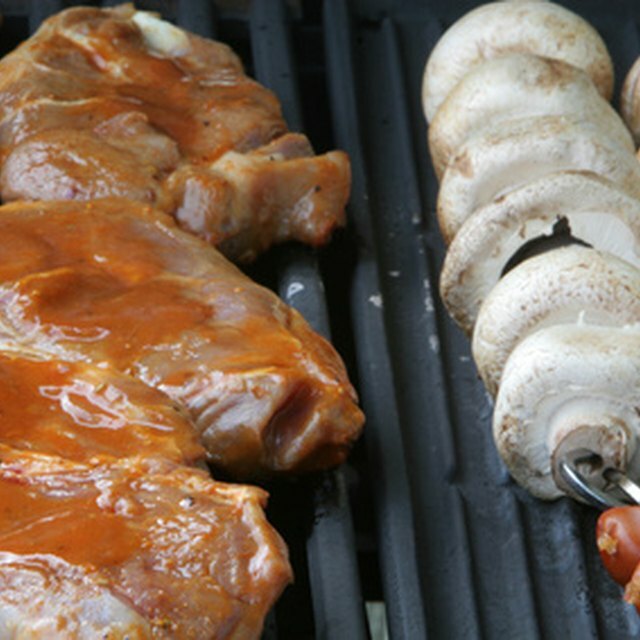 Use long-handled spatulas or tongs when adding or removing meat from a hot grill. How Hot Should a Grill Be for Steaks?